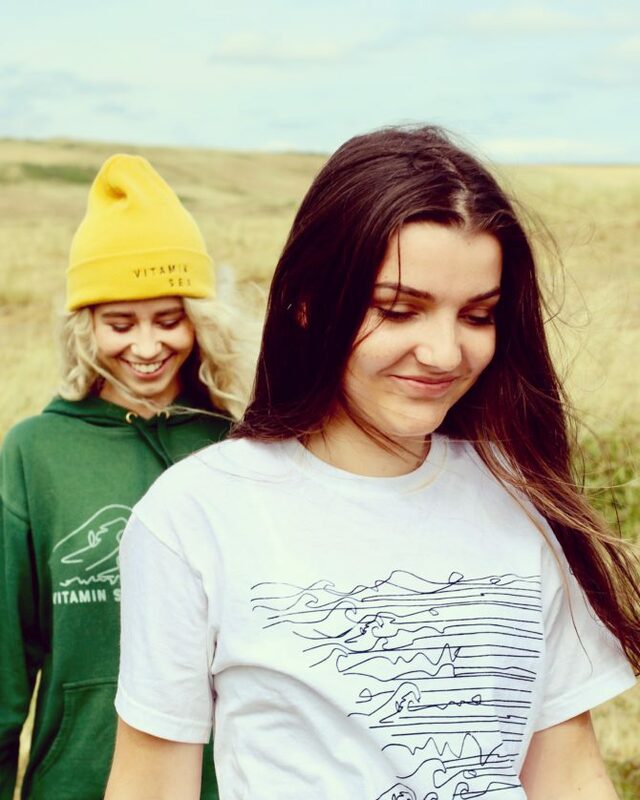 2nd Year Fashion Promotion student Kitty Tindall tells us about the inspiration behind her clothing brand Vitamin Sea and the healing powers of the ocean. “Coming from a very small, coastal town in West Wales I’ve always been surrounded by water, living only a few minutes from an abundance of beaches. This has meant that beach and surf culture has been a big influence for me growing up, something I was introduced to from an early age. As a family, and a community, there was rarely a weekend that didn’t feature a beach trip or surf competition of some sort. I feel incredibly blessed to have grown up in Pembrokeshire as the water enabled me to escape some stressful days by going to the beach, where the world seemed a bit less scary and a bit more peaceful. Mental health has also been something I’ve always taken an interest in, and I feel especially passionate about, mainly through having some very close friends who have struggled incredibly with it. I have always felt the beach makes me feel instantly better just by being there, the very atmosphere would calm my thoughts and give me a better perspective of things. I though this was just a ‘me’ thing, but as it turns out it’s an ‘everyone’ thing, as there is a reason we feel this way. Vitamin Sea is a real thing. Ever heard the saying, you need to go to the beach? And ever wondered why people say this? As if the sea is going to make everything better all of a sudden? Well, did you know…the sea can actually improve your mood. Like seriously-science says so. It has been proven that the sea has a physical effect on our mood, stress levels and state of mind. When we are in contact with the sea, whether we can see it, hear it or are physically in it, our brains start to produce Alpha, Theta and Delta waves. These brain waves are the brain waves we produce when we are at our most tranquil and chilled, the same sorts of brain waves we produce when dreaming. Other aspects like the flat plain of the sea can help evoke a feeling of safety, and the repetitive sounds of the waves can help us feel calm within our bodies. The sea air can help us relax and it can also reduce negative health symptoms as it’s just generally better for us to breathe it in. Researching and understanding this information, I felt it was too good not to share. But people don’t wanna listen to me drone on about science, so I wanted to create a different way to tell people how beneficial the sea can be. I decided to combine my love of illustration and design with surf culture, plus fashion, then chuck in an innovative concept with a sprinkle of politics; and Vitamin Sea clothing was born! I created lots of designs that visually convey this knowledge in a less scientific and more creative way. 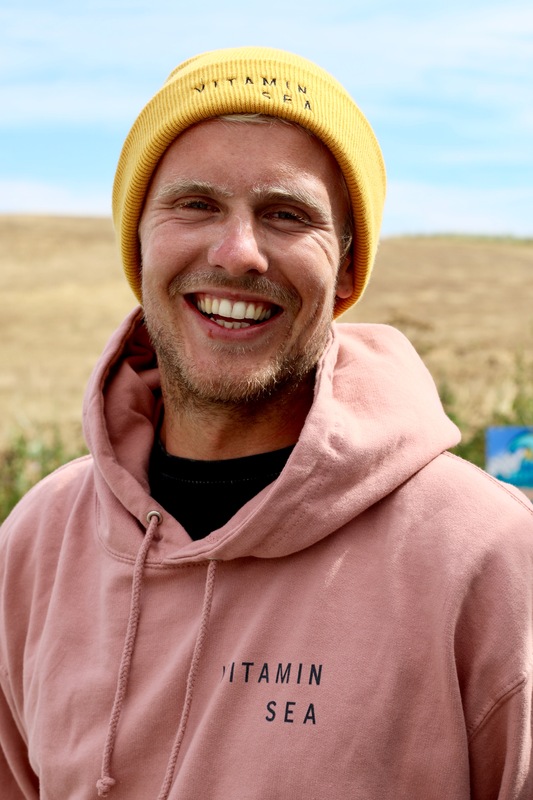 I created a number of designs based on different aspects of the health benefits of the sea and added them to the usual beach culture attire of hoodies, t-shirts, beanies etc to create a surf clothing line inspired by the sea itself.